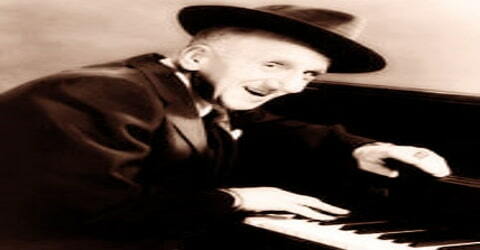 Jimmy Durante – American singer, pianist, comedian, and actor. 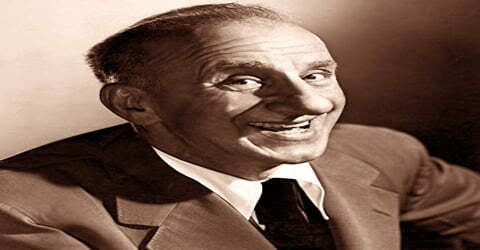 Jimmy Durante, American comedian whose career in every major entertainment performance medium spanned more than six decades, was born on February 10, 1893, Manhattan, New York City, New York, U.S. Durante was a famous American performer/entertainer, pianist, comedian, actor, and singer. His flawless comic timing, the implicit use of comic language and jazzy melodious songs made him the most famous and loved stage, television, silver screen and radio artist in America. His distinctive clipped gravelly speech, Lower East Side Manhattan accent, comic language butchery, jazz-influenced songs, and prominent nose helped make him one of America’s most familiar and popular personalities of the 1920s through the 1970s. He often referred to his nose as the schnozzola (from the American Yiddish slang word “schnoz” big nose), and the word became his nickname. From a very early age, young Durante knew his professional talent for playing ragtime piano and therefore he joined the ‘Original New Orleans Jazz Band’, one of New York’s most famous jazz bands. From there on Durante moved to Broadway, teamed up with other artists to perform on stage or in the movies or on the radio. His catchphrases like, “Dat’s my boy dat said dat!”, “Dat’s moral turpentine!” and “It’s a catastastroke!”, etc. made him extremely popular with the audience and soon Durante started getting a big chunk of roles in the movies, in Broadway, radio, and TV. He was also a lovely singer, who came up with a pop album of his own, titled, ‘September Songs’ which became a best-seller at the time and the songs from this album were used in popular motion pictures, like ‘The Notebook’ and ‘Sleepless in Seattle’. 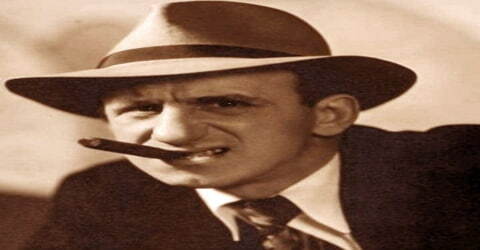 Jimmy Durante, byname of James Francis Durante, byname Schnozzola, or The Schnoz, was born on February 10, 1893, in Lower East Side of New York to Rosa Lentino and Bartolomeo Durate. His family had immigrated to America from Salerno, Italy, and his father was a barber. Young Jimmy served as an altar boy at St. Malachy Roman Catholic Church, known as the Actor’s Chapel. As a boy, Durante wanted to become a saloon pianist. His father, a barber, bought him a piano and provided intermittent lessons. Although Durante left school in seventh grade for a miscellany of jobs, he kept up his piano study, and when he was 17 he realized his dream by playing the piano at Diamond Tony’s Saloon in Brooklyn’s Coney Island. Durante started playing for city’s piano bars and adopted a nickname ‘Ragtime Jimmy’. Soon enough, Durante was hired as a professional pianist by one of the first popular jazz bands of New York-Original New Orleans Jazz Band. Durante’s first wife was Jean “Jeanne” Olson, whom he married on June 19, 1921. She was 46 years old when she died on Valentine’s Day in 1943, after a lingering heart ailment of about two years, although different newspaper accounts of her death suggest she was 45 or perhaps 52. 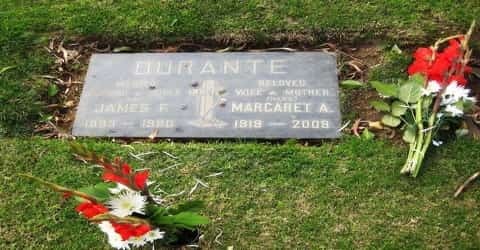 As her death was not immediately expected, Durante was touring in New York at the time and returned to Los Angeles right away to complete the funeral arrangements. Durante got married again in 1960 to a former Beauty Queen of the New Jersey State Fair, Margaret ‘Margie’ Little, when he was 67 years old and Margie was 47. The couple adopted a girl baby, Cecilia Alicia (nicknamed CeCe and now known as CeCe Durante-Bloum), on Christmas Day, 1961. CeCe became a champion horsewoman and then a horse trainer and horseback-riding instructor. Margie died on June 7, 2009, at the age of 89. Durante was an active member of the Democratic Party. In 1933, he appeared in an advertisement shown in theaters supporting Franklin D. Roosevelt’s New Deal programs and wrote a musical score titled Give a Guy a Job to accompany it. He performed at both the inaugural gala for President John F. Kennedy in 1961 and a year later at the famous Madison Square Garden rally for the Democratic party that featured Marilyn Monroe singing “Happy Birthday” to JFK. By early 1916, Durante was working at the Club Alamo in Harlem and put together a sextet called “Jimmy Durante’s Original Jazz Novelty Band.” It was a noisy little combo to be sure, actually having to hold up signs when they played waltzes and fox trots so their ear-bludgeoned audience would know how to respond. It was during the run at the Alamo that one of the acts on the bill started referring to Durante as “The Schnozzola,” what would become his most enduring nickname. The act was an immediate hit, working every speakeasy around New York. He still wasn’t singing or talking or telling jokes in the act yet, just playing his piano in his more than energetic style. Durante remained a part of the Original New Orleans Jazz Band for a considerable number of years and his trademark routine of breaking into a song to deliver a joke with orchestra chord punctuation made him famous in the 1920s. By the mid-1920s, Durante had become a vaudeville star and radio personality in a trio called Clayton, Jackson, and Durante. Lou Clayton and Eddie Jackson, Durante’s closest friends, often reunited with Durante in subsequent years. Jackson and Durante appeared in the Cole Porter musical The New Yorkers, which opened on Broadway on December 8, 1930. Earlier that same year, the team appeared in the movie Roadhouse Nights, ostensibly based on Dashiell Hammett’s novel Red Harvest. The trio of Clayton, Jackson, and Durante came together in a movie based on Dashiell Hammett’s ‘Red Harvest’, titled ‘Roadhouse Nights’ in 1930. Also, in the same year, he teamed up with Jackson for Cole Porter musical ‘The New Yorkers’. By 1934, Durante had a major record hit with his own novelty composition, “Inka Dinka Doo”, with lyrics by Ben Ryan. It became his theme song for the rest of his life. A year later, Durante starred on Broadway in the Billy Rose stage musical Jumbo. A scene in which a police officer stopped Durante’s character who was leading a live elephant across the stage to ask, “what are you doing with that elephant?”, followed by Durante’s reply, “what elephant?”, was a regular show-stopper. This comedy bit also reprised in his role in Billy Rose’s Jumbo, likely contributed to the popularity of the idiom the elephant in the room. Durante also appeared on Broadway in Show Girl (1929), Strike Me Pink (1934) and Red, Hot, and Blue (1936). In 1935, Durante acted in musical Broadway, ‘Jumbo’. The most famous part of the show was when a police officer catches him leading a life with an elephant and on being questioned he says, “What elephant?”. During the early 1930s, Durante alternated between Hollywood and Broadway. His early motion pictures included an original Rodgers & Hart musical The Phantom President (1932), which featured Durante singing the self-referential Schnozzola. He was initially paired with silent film legend Buster Keaton in a series of three popular comedies for Metro-Goldwyn-Mayer, Speak Easily (1932), The Passionate Plumber (1932), and What! No Beer? (1933), which were financial hits and a career springboard for the distinctive newcomer. However, Keaton’s vociferous dissatisfaction with constraints the studio had placed upon him, his perceived incompatibility with Durante’s broad chatty humor, exacerbated by his alcoholism, led the studio to end the series. Durante went on to appear in The Wet Parade (1932), Broadway to Hollywood (1933), The Man Who Came to Dinner (1942, playing Banjo, a character based on Harpo Marx), Ziegfeld Follies (1946), Billy Rose’s Jumbo (1962, based on the 1935 musical), and It’s a Mad, Mad, Mad, Mad World (1963). In 1934, he starred in Hollywood Party, where he dreams he is ‘Schnarzan’, a parody of ‘Tarzan’ who was popular at the time due to the Johnny Weissmuller films. Durante starred in several radio programs during the 1940s, including “The Jimmy Durante Show” and “The Camel Comedy Caravan.” His closing line “Good night, Mrs. Calabash, wherever you are!” became as famous as his felt hat, cane, and his persistent malapropisms and mispronunciations; the line was used to close his various television shows during the 1950s, such as “The Four-Star Revue,” “The All-Star Revue,” and “The Jimmy Durante Show.” His outsize nose became his trademark. By the late ’40s, Durante was on the radio with his own show, sometimes working with partners as varied as Alan Young and Garry Moore. But he truly hit his (second? third? fourth?) stride when television became the new dominant medium. Recreating Club Durant with Eddie Jackson for television brought Durante to a whole new audience who had never seen him work in a night club setting and proved to be enormously successful. Even though it was a variety show in the traditional sense (bringing on guest stars like Bing Crosby, Al Jolson, Eddie Cantor, Sophie Tucker, etc. ), Durante’s manic energy combined with his established character made for an hour of TV unlike any other. Many of the old songs and routines were recycled for this new audience, but the biggest change in Durante’s act came with the show’s closing. Instead of his trademark head-waggling, fedora-shaking “hot cha cha” set-closing walk-off, the new TV ending was a far more somber affair. Durante teamed with Garry Moore for The Durante-Moore Show in 1943. Durante’s comic chemistry with the young, brushcut Moore brought Durante an even larger audience. “Dat’s my boy dat said dat!” became an instant catchphrase, which would later inspire the cartoon Augie Doggie and Doggie Daddy. The duo was one of the nation’s favorites for the rest of the decade. Their Armed Forces Radio Network Command Performance with Frank Sinatra remains a favorite of radio-show collectors today. 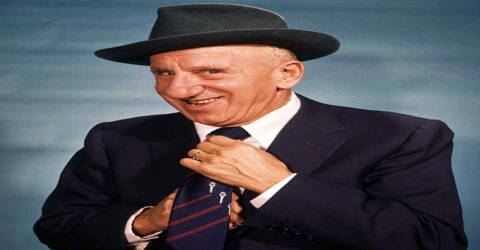 Moore left the duo in mid-1947, and the program returned October 1, 1947, as The Jimmy Durante Show. Durante continued the show for three more years and featured a reunion of Clayton, Jackson, and Durante on his April 21, 1948 broadcast. 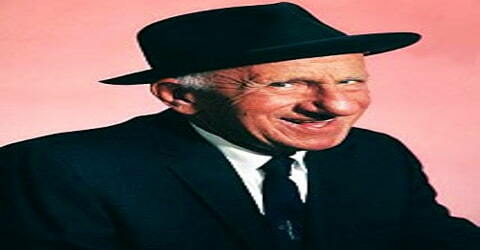 Durante came out with his own show ‘The Jimmy Durante Show’. Now was the time for him to move on to the television and he made his debut in 1950 with ‘The Big Show’. And in the following year, he was one of the hosts on ‘4-Star Revue’. From 1950 to 1951, Durante was the host once a month (alternating with Ed Wynn, Danny Thomas, and Jack Carson) on Wednesday evenings at 8 p.m, on NBC’s comedy-variety series Four Star Revue. Jimmy continued with the show until 1954. 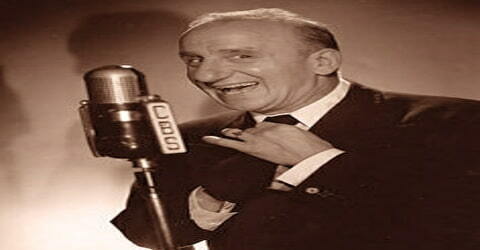 Durante then had a half-hour variety show – The Jimmy Durante Show – on NBC from October 2, 1954, to June 23, 1956. Beginning in the early 1950s, Durante teamed with sidekick Sonny King, a collaboration that would continue until Durante’s death. He was often seen regularly in Las Vegas after Sunday Mass outside of the Guardian Angel Cathedral standing next to the priest and greeting the people as they left Mass. Durante could do outrageous slapstick and tug at an audience’s heartstrings with equally consummate ease. The ’60s saw him busy as ever with more TV projects and a great deal of night club work. Although his character stayed the same, his twilight years imbued it with an old man wistfulness that made him even more lovable. At the age of 70, his recordings of old standards, issued by Warner Bros as September Song, became an unexpected Top 40 album hit in 1963. He made his final film that same year as Smiler Grogan in Stanley Kramer’s It’s a Mad, Mad, Mad World, where his cameo deathbed statement had him literally kick the bucket. On August 15, 1958, for his charitable acts, Durante was awarded a huge three-foot-high brass loving cup by the Al Bahr Shriners Temple. 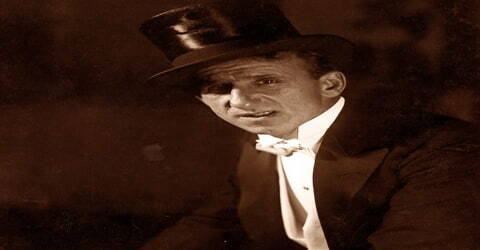 The inscription reads: “JIMMY DURANTE THE WORLD’S MOST FAMOUS COMEDIAN. A loving cup to you Jimmy, it’s larger than your nose but smaller than your heart. Happiness always, Al Bahr Temple, August 15, 1958.” Jimmy Durante started out his career with Clayton and Jackson and when he became a big star and they were left behind, he kept them on his payroll for the rest of their life. In 1962-63, Durante did motion movies like, ‘Billy Rose’s Jumbo (1962)’, a musical film whose title came from Durante’s Broadway musical ‘Jumbo’ and ‘It’s a Mad, Mad, Mad, Mad World (1963)’ which was an epic comedy film. Durante recorded an album of pop genre, ‘September Song’ in 1963. The album became a best-seller and Durante was re-introduced, to yet another generation, almost three decades after he was first recognized in the world of ragtime piano. Durante’s increasing frail condition worsened through the rest of the ’60s. In 1970, he had a stroke which confined him to a wheelchair and relegated his performing days to old film clips and scrapbooks. He died of pneumonia in Santa Monica, California on January 29, 1980, twelve days before he would have turned 87. He received Roman Catholic funeral rites four days later, with fellow entertainers including Desi Arnaz, Ernest Borgnine, Marty Allen, and Jack Carter in attendance, and was interred at Holy Cross Cemetery, Culver City. Durante’s entertainment career started with ‘Original New Orleans Jazz Band’ which took him to acting in Broadways and entertainment shows. His comic timing earned him a place in the movies, ‘Roadhouse Nights’, ‘It’s a Mad, Mad, Mad, Mad World’. Not Just that, his talent took him to television with ‘4-Star Revue’, to radio with ‘The Durante-Moore Show’ and later ‘The Jimmy Durante Show’. He was also a singer and his album ‘September Song’ was a hit of its time. His catchphrase at the end of his show on the radio, ‘Goodnight Mrs. Calabash, wherever you are’ was meant for his first wife who died due to a heart ailment.